Best pulled pork ever. Best smoked chicken ever. Best baked beans and potato salad. Ever. But no ribs – yet. 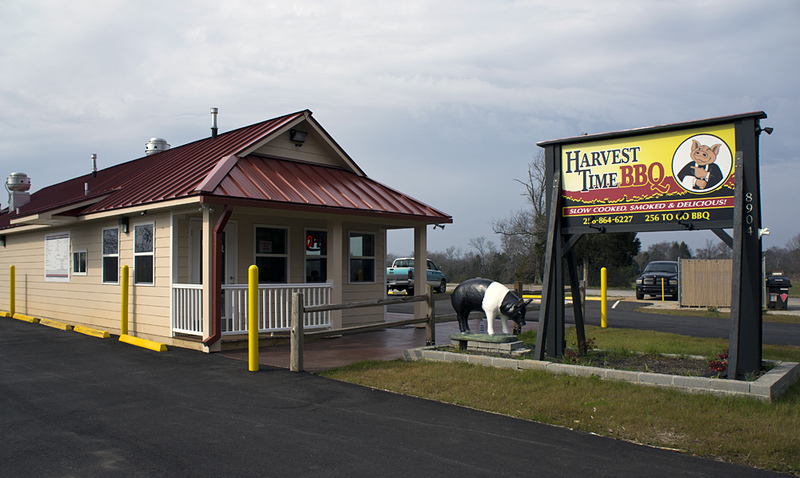 The folks at Harvest Time BBQ in Harvest were testing their first batch when we went there for lunch today. Apparently, they want to get it right before it finds its way on the menu. This philosophy, that quality comes before all, and it is only worth doing it, if it’s done right, is evident in every little detail at that place. Most other BBQ pit masters use hickory or mesquite wood for their fires. The “Pork Dork” – it says so on his T-Shirt – uses pecan wood. 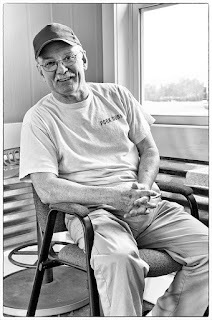 It started when he used the wood of two pecan trees in his own backyard at family barbecues, and he still uses it at his new restaurant. I’ve never had pecan wood smoked pork before, at least not knowingly, but that’s what I want to have exclusively from now on (… not gonna happen, I know …). It provides a very smooth, well rounded aroma, which is still distinctively smoky, but without the somewhat sharp bite of its hickory and mesquite cousins. The pork is smoked – with just a little salt added - at very low temperature for up to twenty hours, which makes it supremely tender and juicy. And flavorful - it actually tastes like smoked pork, and not like smoke with pork. 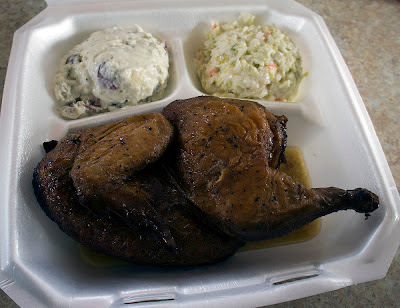 So , of course I had my customary pork plate, with potato salad and slaw. Well, actually my wife’s chicken came with those sides, whereas my plate came with her baked beans. A little mix-up that worked to my advantage – eventually, I got to eat all three sides. The potato salad was creamy and a little tart, with just the right amount of herbs and spices – I’d say this came near to perfection. The same is true for the baked beans, which did not even have a hint of sweetness, but came with big chunks of meat and a very hearty taste. The slaw was very crunchy and creamy, and tasted very fresh, but although it had a noticeable vinegary aroma, it was a bit too sweet for my taste. Not bad, not bad at all, but in comparison with the potato salad and the baked beans a clear bronze medal in this contest. Usually, my wife would have had the ribs, but as I mentioned above, it is not on the menu yet. So she settled for the half chicken – and was blown away. She had a cup of white sauce at the side, but she did not use it at all. Instead, she soaked the meat in the juices that accumulated on the bottom of the plate. Did I ever mention that she is the real meat lover, in our family? Well, this chicken satisfied all her carnivorous cravings. The meat was succulent and the skin was crisp, and the flavor was smoky but not overwhelmingly so. Too bad that the bird was so big that by the time she was finished with it, all the sides were gone, except for the bag of chips. I almost forgot, but the pulled pork came also with a sauce on the side (This is important: on the side. The Pork Dork’s comment on this is that “putting sauce on BBQ before serving is usually done to cover up something, such as it being too dry.” Amen, man!). You have the choice between a vinegar based thin and hot variety, and a thick and sweet one. I choose the vinegar sauce, which has a medium kick through some ground peppers – nothing fancy, just the right amount of hotness to make the flavor of the pork pop. A piece of Texas toast completes the meals, and for just under nineteen bucks, including two sweet teas, that is a very fair deal in regards of the amount of food you get, and a downright steal in regards of the quality they give you for it. The place itself – which is spotless, by the way - has only very limited space to sit down inside– about a dozen or so chairs around a counter and one tiny table. If all chairs are occupied, that should make for a very cozy and intimate atmosphere. 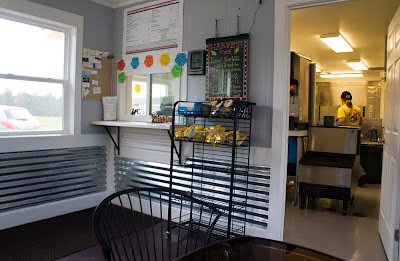 But most people seem to use it as a drive-in kind of place, which is really a shame since they don’t have the opportunity to experience the extremely friendly and welcoming treatment you get from the staff. Southern hospitality at it’s best. And there is something else, which may not be on top of the list for most customers at most BBQ places, but it also shows this attention to detail, this overall thought through philosophy that goes this one step beyond general expectations. They filter their water through a reverse osmosis system, to remove toxins such as fluoride and chlorine. Really, everybody should do that before the water is used for even brushing one’s teeth, let alone for drinking or cooking. And they use 2 oz sauce containers – double the size which is usually found in restaurants - which they only fill half, so that they don’t spill when opened. Also, they don’t use MSG in any of their products. 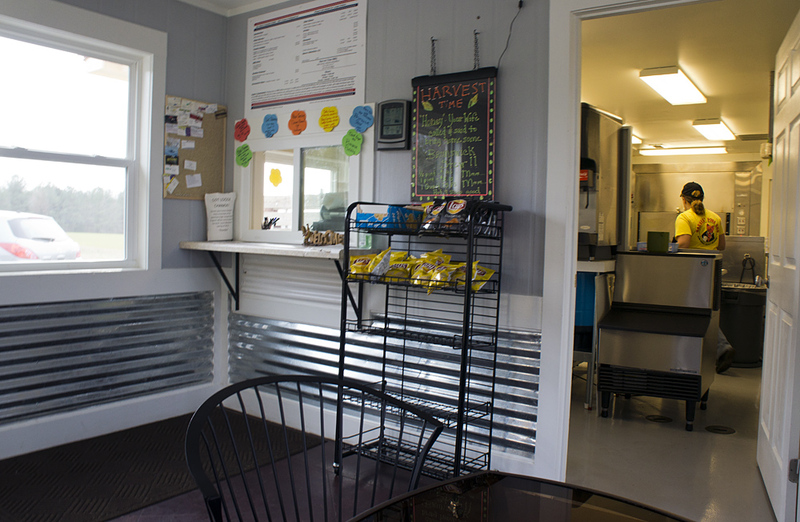 If there is such a thing as an “Organic” BBQ, this little place in Harvest, Alabama, certainly qualifies. 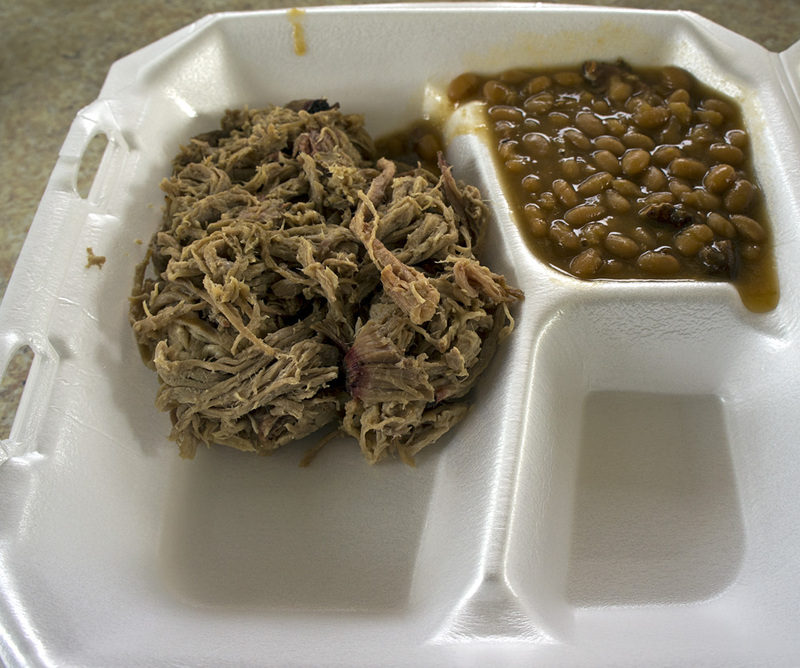 I always knew that BBQ, if done right, was really the health food of the South. We're coming down soon to satisfy our BBQ craving. We'll report back after our feast! 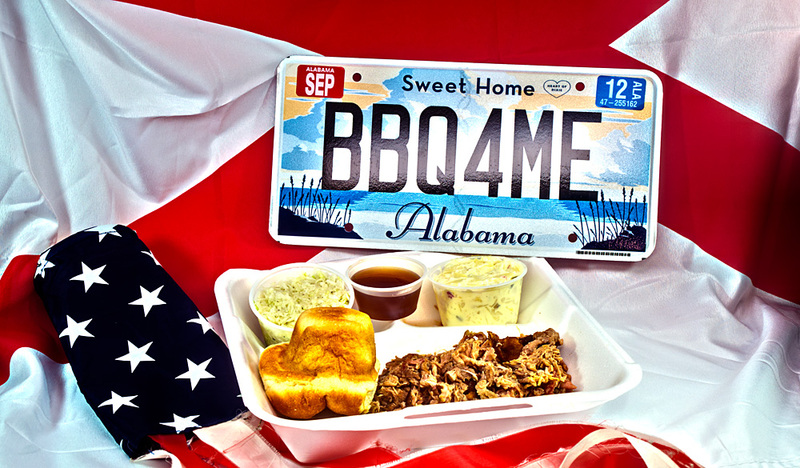 Best BBQ, sides and dessert we ever put in our mouth! !